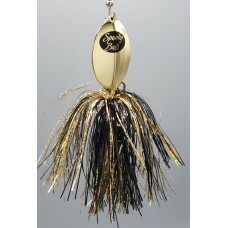 The St. Clair Special Series offers a single 7/0 mag willow blade, bucktail type in-line spinner baits from Spanky Baits features a unique action "FLASHABOU" Tail. These lures have a crazy action and attract fish in a big way. The vibration of the mag willow blade along with the visual addiction of the Flashabou makes this a lure that will go down in history. All this lure does is catch monster fish! (2) Super Durable 6/0 treble hooks. a minimum of 2 lures must be purchased.